Ghana, gateway to Africa, and its capital Accra hold unforgettable memories to several poets from different parts of the world, memories that will linger and echo in the various corners of the earth, scattering seeds of peace, that elusive peace, that can only be obtained in a unified and harmonious human relationship. Believing that poetry and arts can make a big difference in unifying nations and attaining peace and brotherhood among men, a medical doctor, whose passion is more of poetry than medicine, ventured in the poetry realm. Armed with strong determination to give his best to change ordinary things into extraordinary, monotony into challenging unique ideas, impossible into possibilities, simplicity into complexity, he proceeded to search for every color of the rainbow, for aliens in the atmosphere, delved into deep blue seas, soared up high in the skies, glided along the horizons, sailed across the ocean, climbed the highest peaks, and out into the universe and landed with a very precious masterpiece, a three volume book of poetry, the PENTASI B. It’s a marvelous creation of a master of his arts, an out-of-the-box blending of poetry, painting, music, and prose, defying the academe, daring minds to unfold its mysteries. One every unique feature of PENTASI B is its protruding surface which when scrutinized by another Filipino poet, Franco Sangreo, turned out into provisions for “Braille”, the key for the blind to be able to read his poetry. Lacking support from anybody but himself and exclusive friends, he bravely reached out for his dream to publish his brainchild. PENTASI B was published in 2011 after surpassing several difficulties and thus, he began to reap the fruits of his labor. In May 25, 2012 he was awarded as Father of Visual Poetry by the World Poetry Canada and International headed by Adriane Sawyer given in Richmond, Canada. And on the same year, he was awarded as Father of Philippine Visual Poetry by OTUSA.TV at Los Angeles, California, USA. It was then that his book of three volumes which was auctioned in California at 10,000 USD per volume and was won by M. Global Solutions. Generous at heart, from its proceeds, he donated it to OTUSA Foundation for fostering education of poor but talented students in the Philippines. The ever enthusiastic poet did not rest on his laurels. His indomitable spirit led him to harness notable poets of different nations in the name of love and friendship. With his motto “no colors, no races, all colors all races, all loves embraces”, he befriended the cream of world poets who willingly responded to PENTASI B’s daring call “to inspire, to heal, to awaken”. The Pentasians went global and membership, though strictly screened for quality, continuously increased under the umbrella of PENTASI B World Friendship Poetry. In the year 2014, the author of the world famed PENTASI B was honored and awarded in Istanbul as Görsel Şiir Babası by the Turkish people through KIBATEK, a prestigious Turkish organization composed of the world’s talented and gifted literary writers and artist. In the same year, he was acclaimed in his home town, Tanay, Rizal, Philippines as Natatanging Anak ng Tanay (Illustrious Son of Tanay) in the field of Literature. The year 2016 marked big leaps on his poetic journey. On invitation of the Pablo Neruda Cultural Association, in partnership with the international Literary Kibatek Festival 39th Edition which was held at Taranto, Italy, this Filipino poet was honored and acknowledged as “IL PADRE DELLA POESIA VISUALE“ on February 2016. It was on this occasion that the audience was set into a loud and long lasting burst of applause when he rendered his poetic piece in the Italian language with his booming voice and captivating style in reciting his poem. Where the other poets read their poems, the poet from the Philippines rendered his piece holding nothing and in the Italian language which earned him the respect and awe of the famous circle of poets that formed the audience. 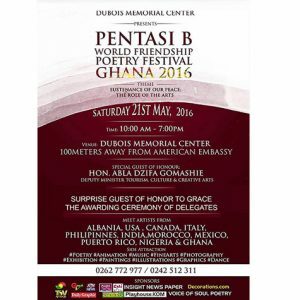 On May 2016, the Republic of Ghana, in the African Continent, hosted poets, writers, and artist to celebrate the PENTASI B Festival of Poetry, Culture and the Creative Arts. On May 17, the delegates began to arrive in Accra all the way from Egypt, Canada, Puerto Rico, USA, India, Morocco, Nigeria, Pakistan, and the Philippines. Organized and hosted by the great African poet-musician, Benjamin Nii Oku, with the cooperation of his Ghanaian Team, he remarked: “This global celebration is the first of its kind in the soil of Africa and will impact the need for peace and will balance the poetry equation in Ghana.” The theme of the week-long event is SUSTENANCE OF OUR PEACE, THE ROLE OF THE ARTS. The delegates guided by the hosts, Nii Oku and the Ghanaian Team, paid courtesy calls to the sector Ministry and visited selected palaces and media houses. There were story telling sessions at Osekan Beach in Accra, poetry engagements with students, and visits to tourist sites. The delegates were also interviewed on TV Africa including the Father of Visual Poetry and the host/organizer. The interviewers were renowned radio and TV personalities like Johnny Hughes, Naa Asaase, Nii Aye Solomon, and many others. The main event was held on May 21, 2016. The unique celebration featured splendid poetry performances, rhythms and verses, cultural presentation of music and dances, and a colorful exhibition of Ghanaian products. During the cultural presentation, talented Ghanaians remarkably and passionately performed jolting the beauteous Luz Maria Lopez, the delegate from Puerto Rico, to dance gracefully to the rhythm of African drums. The organizer/host of the event, the poet-musician Benjamin Nii Oku, played the flute to the delight of the audience. Then came the much awaited awarding moment. A magnificent trophy symbolizing PENTASI B, made in African wood, designed by non-other than the master of his arts himself, Doc Penpen, and made in Africa by respected Africans artists, was individually and gloriously received by each delegates: George Onsy (Egypt), Ibrahim Honjo (Canada), Luz Maria Lopez (Puerto Rico), Muhammad Shanazar (Pakistan), Rajendra Padhi (India), Dr. Armeli Quezon (USA-Philippines), Santosh Bakaya (India), Monsif Beroual (Morocco), Kolade Olanrewaju Freedom (Nigeria), and Timileyin Gabriel Olajuwon (Nigeria). Not only the delegates were recognized, but also deserving multi-talented Ghanaians received the coveted title in appreciation of their full support for the success of every activity during the affair. The lucky Ghanaian awardees were Benjamin Nii Oku, Johnnie Beresford Hughes, Oswald d’ Atl Entertainer, Gamel Sankarl, Nene Tetteh Adusu, Prof. Lade Wosornu, and Hon. Abdul Rashid Pelpuo. Special citations were also extended to Melody Ramos Cortez, Lilian Dipasupil Kunimasa, Ernest Simon Ashie, Eugenia Atakora, Thomas Duku, Michael Blankson, and Joseph Pobee, who with or without their presence at Ghana continuously support and monitor the day to day activity of the world poets poetry festival. 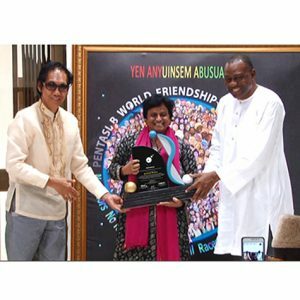 Utmost gratitude filled the hearts of each awardee for the precious award “PENTASI B UNIVERSAL INSPIRATIONAL POET 2016” they received for they were signed not by local artists or officials, but by the highest officials, respected authorities of the Republic of Ghana and by Doc Penpen Bugtong Takipsilim, Father of Visual Poetry and Creator and Founder of PENTASI B. The foremost awardee, the star among the stars, the strong, determined man who knows no obstacle to fulfill his dreams, the one and only Father of Visual Poetry, today, in the whole seven billion population of the world was honored by the Republic of Ghana with a big title, “ANYUINSEM AGYA” (Father of Visual Poetry). The name that is now reverberating in the world is Dr. Epitacio R. Tongohan, known in the poetry world as Doc Penpen Bugtong Takipsilim. His beautifully framed certificate of recognition was signed by the highest officials of the Republic of Ghana: Hon. Abdul Rashid Pelpuo, a State Minister at the Office of the President, Republic of Ghana; Numo Akwaa III, Nae Wulomo, a Highest Priest of GA State, Republic of Ghana; Hon Nii Lentey Vanderpuye, a Minister of Youth and Sports, Republic of Ghana; and by the great host, organizer, musician/poet, Benjamin Nii Tetteh Oku. Doc Penpen’s name has become a legend and his noble goal for humanity through his poetry and arts will last till the end of time. Proud that he’s a Tanayan, a Rizaleño, and a Filipino! His obsessive dream for a real and true Humane World shall make Philippines as the “Poetry Heart of the World” is now becoming a reality. Doc Penpen now shines as the brightest glittering gem — our Philippine’s national treasure. Penpen is the man that makes things happen! Certificate of Recognition as “ANYUINSEM AGYA” of Doc Penpen Bugtong Takipsilim given by the Republic of Ghana. Doc Penpen B. Takipsilim kneeling, bowing & kissing the Certificate of Recognition (as a symbolic sincere acceptance of honor) given by the Republic of Ghana. Prev: Come On, We Need Your Likes, “Sophy Poetry & International Translation Websites” Fully Updated!